In my long running career, I have often been asked why I run. Or, are you training for something? ? Do you have goals? The answers have varied depending upon my age. In my teens, I was competitive. Therefore, I was ALWAYS training for races. In my twenties, I was either rebellious (refusing to run) or so injured it was impossible at times to even walk. In my thirties, I ran to get back in shape after my second son was born. In my forties, I was running to stay sane, struggling to function in a disintegrating marriage and an ugly divorce. I reached fifty. Free and forging new paths in my life and setting new goals that included competition once again, though never nearly matching the intensity of my teen years. When I lived in New England, much of my running took place in the early hours of the day, often in that space when it seemed darkest, minutes before sunrise. I would rarely see a fellow harrier. I didn’t mind and I always felt and was safe. These days, my route is different. We live on a city park that abuts a bike and running trail. 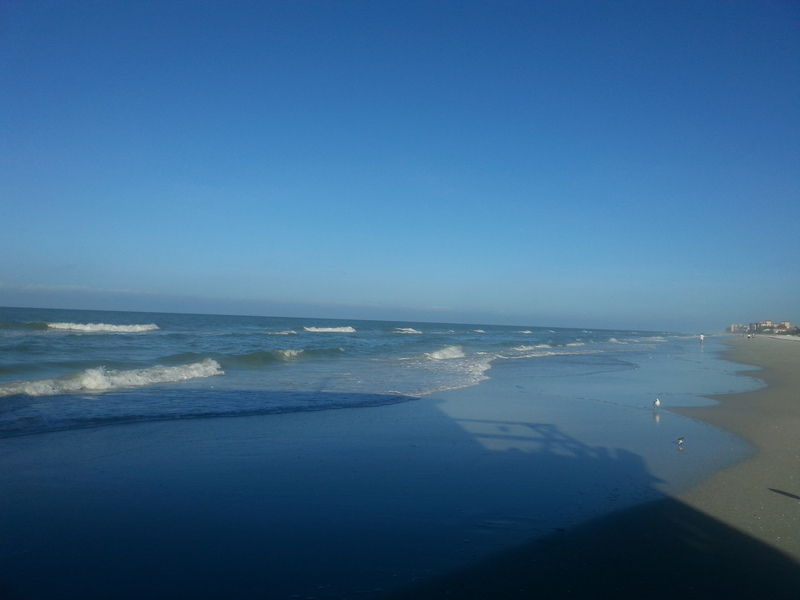 But sometimes I take the short drive to the beach and run with just the sound of the Gulf surf and forgiving sand. I run as early as I am able to safely do so. No dark starts here for a lone female. However, there are benefits to these delays. I see many more runners, walkers and cyclists. And the more I’m out on the trail, the more regulars I see. For a small town New England chick, it brings a sense of comfort as I continue to adjust to a more densely populated area. And there’s a terrific variety of fleet footers out there as well. All doing their part to stay in shape, work on their goals and maybe even achieve a little peace of mind. One of my favorite groups to observe is the FAB 50 women who run on Saturday mornings. All shapes, sizes and ages out there working really hard while clearly enjoying the camaraderie. Whenever I see them, I am always brought back to the times when the sport was closed off to women. (Heck, I remember when many sports were non-existent for women!) I know and understand the history behind the fight to participate in and create sports for girls and women and I appreciate the battles won, even more so as I get older. If it weren’t for the efforts of those unnamed many, none of us would be enjoying the right to discover and uncover parts of ourselves that we never knew existed. It would be easy for me to write a political opinion or cite the landmark court cases and laws that allow me and other females to throw on our running shoes and shorts, enter races and compete against men, each other and ourselves. Simply put, this right to participate happened as a result of long struggles and hard won legal battles that in some instances seem to have little to do with running. But every single one of them is connected to each other and the present day independence from which women and girls continue to benefit. Running gives a woman positive bodily integrity. The sheer act of it is an example of how women should not be controlled by restrictive laws or narrow thinking that seeks to put us in our place or shames us into choices that someone else is making for us and our lives. Running restores broken spirits. Running returns control of one’s own life to the person it matters to the most-HERSELF. So why do I run? I run to stay EMPOWERED. My goals? To remain a FREE and SELF-DETERMINED WOMAN. And what am I training for? MY LIFE. This post has been churning for a while. The final push came after listening to Terry Gross’s Fresh Air interview with Gloria Steinem (ww.npr.org/2015/10/31/453029648/fresh-air-weekend-gloria-steinem-the-witches-carrie-brownstein), a heroine of mine since I was a teenage girl in the 1970’s. I recently added another year to my fifth decade on this side of the world. I must say I love this decade most of all. When I think about it, I spent the first decade in the warm embrace of childhood, the next in the weird and off center world of adolescence and young adulthood and part of my twenties being a true blue party girl before I settled down in marriage. My thirties were an intense period spent raising my sons. I would like to write off my forties in some respects; I think that I spent most of that decade just surviving! But then again, I believe that period set the stage for the freedom and peace of mind that I am now experiencing. I was talking the other day with my fiance’ ( I totally love saying that by the way) about the fact that when you reach our age, you feel like you’ve lived several lives. I mean, really, I am old enough to remember the 1969 moon landing ( I was eight and the memory is quite vivid), the revival of the women’s movement (I used to get Ms. magazine in the mail when I was a teenager), the Vietnam War, disco, punk and eighties music (but seventies rock still rules!). It sometimes blows my mind that I have lived this long, not because I feel old but because so much has happened in what seems likes such a short period of time. For women in particular (but certainly not totally excluding men), our bodies are markers of our age and of the life we have led. Ignoring the media blitz of false body images is a constant practice of vigilance for many of us regardless of our age or size. Ignoring the images of youthful good looks for those of us who are past forty only adds to the mix. When I think about it, my body has been reincarnating itself for as long has I have been experiencing each decade. I never was the girl who was slim of waist and rounder in the hips. My mother used to buy me “boy’s cut pants” when I was young because none of the girls pants fit quite right. As I became a teenager, my body looked much the same due to the fact that I ran 50-70 miles per week. Zero body fat leads to low weight and no breasts (plus no menstrual cycle)! In fact, I don’t think I wore a running bra until I was nineteen! Of course, my college years were marked by less running and more pizza and beer. For the first time in my life, I felt and looked fatter. Plus, I had finally reached puberty! When a more regular work out and less of a party regiment began in my mid twenties, my body became more solid but never as slim as it once was. Then, of course, I became pregnant and that changed everything. It was a challenge to feel attractive and not fat. My pregnant body was huge on my 5’4″ frame and I gave birth to babies that were one-third of my height! Never mind their large weight. The pressure to return to pre-pregnancy weight and shape was present for sure. I had no trouble doing either as I love to exercise and eat well. But let me tell you, stretch marks never go away! My middle bears witness to the size of my sons and I have learned to embrace and accept this fact. It was during my mid to late forties that my body took on a whole new shape. The stress and trauma of separation and divorce caused a very dramatic loss in weight which lingered at a low point for nearly two years. Funny thing is, many of my friends, family and colleagues were worried and thought I looked seriously ill while my estranged and soon to be ex-husband thought I looked great. It wasn’t until the worse of the situation was over that I could begin to eat again. And I take care of my face without breaking the bank. Wash, tone, moisturizer and a little makeup work well. I color my hair and recently added foils to the hair care list. They enhance my look-according to my hairdresser-and do not hide my age. The way I look at it, I am being born again. I have gotten another chance to start my life over. It is not only fun but filled with laughter, love and true happiness. My hope is that I can spread this kind of energy to others and live my own life as if I were going to be born again tomorrow. Last week I went to my doctor’s for my annual check up. As part of the routine, I, of course, had to get weighed. Of all the things that are done in the process of a woman’s visit, I find this to be the most dreaded piece. It is the one part where I wish that I could be totally naked in order to get the “most accurate” reading of my weight. Of course, this is impossible so the only part of my clothing that I can remove is my shoes. Although I possess a scale, I never weigh myself. I feel that I will note any poundage fluctuations through how I fit into my clothes. So far this method has worked fairly well. After all, I am very fit; I exercise about 7 hours per week and I eat very healthy food. I am well aware of my body changes as I have entered my fifties and have come to accept these shifts. In fact, I really believe that middle age is called that because we all (male and female) get thicker in the middle! Still,this number sort of freaks me out despite my doctor’s assurance that I am the right weight for my age and height (5′ 4″) and the amount of my body’s muscle mass. (I have been strength training 2-3 times per week for at least 17 years.) So what is the deal here? I believe that some of it stems from the fact that my weight reached an all time low of 109 lbs just over four years ago. I had not weighed that little since my senior year in high school when I was a running maniac and just entering puberty. The weight loss had everything to do with the trauma of the divorce process followed by my mother’s fatal diagnosis and subsequent death. As a colleague of mine said to me recently, “It hurts to eat.” That was certainly true in my case. There would be days that I would actually forget to give myself nourishment. Other times when I did eat, I would immediately get sick. I had to be carefully monitored by my therapist who eventually diagnosed me with borderline anorexia. As a result, I had to strategize ways in which to feed myself. Part of it, of course, was to keep a food diary of the items that I ate each day. Another- more unique way- was to ask my friends to feed me. There were times when I would literally call someone and ask them to stop at the store and buy me a meal ( my therapist encouraged me to give in to my cravings). This was especially helpful during those times when the legal matters of my divorce were especially intense. Other times, I would happen to stop by a friend’s house to drop off something and subsequently (upon taking a look at me) be invited in to share a family meal. As a part of the strategy, I also had to weigh myself in order to keep track of any more loss or perhaps some gain in weight. It is a strange feeling to watch the numbers descend when you are making (what you believe at least) your best effort not to lose, but to gain pounds. Yet, underlying this so-called “effort” was the reality that I needed to buy new clothes in smaller and smaller sizes. No woman in her right mind would scoff at clothes shopping of course! And shopping for clothes because of weight loss is usually a celebration and not a burden. So, I had lots of fun trying on clothes that were a size 2 and fit like a glove (especially the little black number that I got on without having to unzipper it). The piece de resistance, however, came when I was about to go on my first romantic date with my now finance’. The black lace skirt and deep pink one shoulder satine top were a size 0! Truthfully and biologically, however, I was in the wrong state of mind. Anorexia (no matter how mild a case) changes your brain. What you view in the mirror and what others see could not be more different. And this is the image that has stuck with me even until this day. When you are caught in the anorexic vortex, weight gain is seen as a failure of control. It didn’t help that my body was at the same time undergoing its middle age changes. It was only through therapy, yoga and the love and concern of my sons and friends (as well as my beloved) that helped me get back on the road of normalcy. The black lace skirt and pink top still sit in my closet. The photo of our romantic date sits atop the dresser. The romance lives on but I will never wear those clothes again. And I am not afraid to reveal my weight: a strong and healthy 130 pounds!